DURHAM, N.H.—The number of people living in poverty would be significantly higher without the combination of five government programs— Social Security, disability benefits, federal and state cash assistance, the Earned Income Tax Credit (EITC) and the Supplemental Nutrition Assistance Program (SNAP), according to new research by the Carsey School of Public Policy at the University of New Hampshire. The five programs combined keep 11.5% of rural and 7.6% of urban residents out of poverty, the research found. Social Security is especially important; without it, poverty would increase by 4.4% in urban areas and by 7.6% in rural areas. 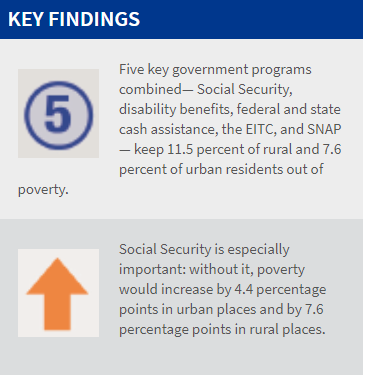 Poverty in rural areas would rise to more than 20% just without Social Security. The research was conducted by Jess Carson, research assistant professor with the Carsey School’s Vulnerable Families Research Program, and Beth Mattingly, a policy fellow at the Carsey School.